Just when we thought summer is over, we got a very busy weekend ahead of us. There are so many Jersey Shore events going on that we’ll have to separate them in two articles. First let’s look and what the Northern part of the Jersey Shore has in store for us this weekend. Sunday in Red Bank it’s the Red Bank Guinness Oyster Festival presented by the Asbury Park Press, from 12pm to 7pm in the White Street Parking Lot (behind the Dublin House). This street festival anticipates a great time and is fashioned after the 56 year old Galway Oyster Festival which celebrates the opening of the Oyster season. It will be a huge food and music festival which will showcase Red Bank’s excellent restaurants as well as entertain thousands with great, live music. 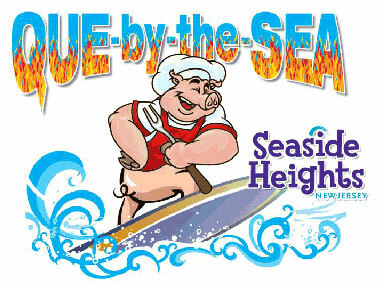 Seaside Heights will host the Que-by-the-Sea festival, a new fun-filled weekend packed with musical entertainment, artists and crafters, mouth watering specialties, and featuring the second annual Seaside Heights BBQ Competition on Grant Avenue. The schedule is: Fri 5-10 p.m., Sat 10am-10pm, Sun 10am-6pm. Que-by-the-Sea, which is sanctioned by the Kansas City Barbeque Society, features contestants from throughout the tri-state area. Since we’re talking food and drinks, there’s another great event in Belmar: Beer on the Pier, the first ever beer craft fest in Belmar. It will take place on Saturday, Sep 25th, between 2-6pm at the Marina. There are over 25 breweries participating, including: Lagunitas, Dogfish Head, Left Hand, Smuttynose, Southampton, Magic Hat, Avery, Hometown, East Coast Beer Co., Ithaca, Weyerbacher, Troegs and more. Ocean Grove will host its 13th Annual British Car Show, between 10am-4pm on Main Ave. You can browse among the 90 cars on display while enjoying the ambiance of this charming Victorian town. Manasquan has its Fall Arts & Crafts Festival, a full day of fun and shopping. 80 crafters, a scarecrow workshop, face painting, Antsy the clown and much more. Read also about Jersey Shore Events, Southern Edition! If you’re looking to rent a house at the shore, check out ShoreVacations.com, Jersey Shore’s biggest vacation rentals resource. It lists hundreds of rental homes and condos from Sandy Hook all the way down to Cape May (including Belmar, Point Pleasant, Seaside Heights, Ocean City, Long Beach Island, Atlantic City or the Wildwoods). It’s a one-stop website for planning your Jersey Shore vacation, featuring beach information, local events, weather updates and more!